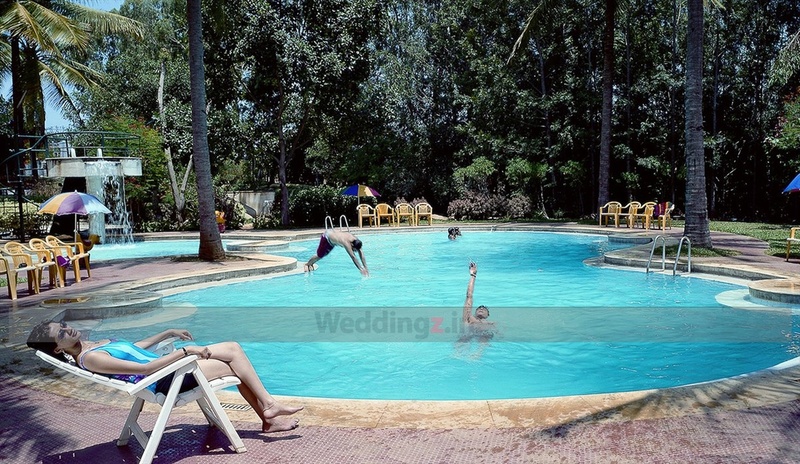 Estate Club and Resort, Bangalore, is a premium wedding venue situated in the Garden City. The two banquet halls are ideal pre-wedding ceremony hosting places whereas the lawn area is huge with lush greenery on all sides perfect for couples looking to tie the knot amidst nature. The chefs at this club are culinary experts and dish out delicacies that will loved by one and all. Located near Smilee Green, the venue has capacious rooms made available for your outstation guests as well as sizable parking facility. The Estate Club And Resort located in Hosur Road, Bangalore has Wedding Hotels, Banquet Halls, Wedding Lawns and Wedding Resorts. Party Hall can accommodate upto 150 guests in seating and 200 guests in floating. Lawn can accommodate upto 2500 guests in seating and 3750 guests in floating. Vegetarian and Non Vegetarian food is served at this venue. Features of this wedding venues are : Food provided by the venue , Non-Veg allowed at the venue , Alcohol allowed at the venue , Outside alcohol allowed at the venue , Halls are air Conditioned , Ample parking , Baarat allowed , Fire crackers allowed , Hawan allowed , Decor provided by the venue , Packages starts at Rs 600 per plate for vegetarian menu and at Rs 700 for non veg menu. Decoration starts at Rs 30000.